Installing Your Do It Yourself (DIY) BentGrass Putting Green From Turf Avenue. Installing a Bent Grass Putting Green From Turf Avenue doesn't require you to have a green thumb. You don't have to be a greens-keeper or have special equipment. Most of the tools required for the putting green installation process you probably already own. And the ones you don't have you can find at a local rental company. So what are you waiting for? Check out placements in level areas of your property. Take a string, garden hose, or extension cord and lay it in the general area and shape you desire. The width of our turf is15 feet so you will need to think in widths of 15 feet when designing your green (15, 30 feet wide) unless you plan on cutting and seaming the rolls (if this is your intentions please see steps 9-12 first). The turf can later be cut to any length although it is sold in 5 foot increments. By marking the area like this you will be able to actually see the size and shape. Refer to your diagrams in your brochure to help determine a size and shape. Once you see the size and shape make sure to practice your golf game a little. You may decide you need a larger green. Use spray paint to mark the entire outside perimeter of the shape. This marked edge will be used as a reference point where your sub base material will be placed. Be sure your green is accessible from other areas of the yard by chipping and pitching to the marked area. Whether you are doing an in-ground or an above ground installation use a sod cutter or shovel to remove the grass in the area you have marked with spray paint. Remove any loose debris after the sod has been taken out. Compact the bare ground using your plate compactor to ensure a solid foundation for the crushed stone base. Lay out the weed barrier on top of the ground in the area where the green will be installed. The weed barrier acts as a stabilization cloth and does not allow the crush stone sub base material to sink into the ground. Add an edging as a border along the entire outside perimeter of the area where your stone base material will go. This will ensure the base material will stay in the marked area and will not be pushed out beyond your area when compacting the base. If you are using a block border or retaining wall then the weight of the block will hold the base in place. The base is just that, It is the foundation of your new golf tool... The more time that is spent perfecting the surface of your base material, the better the surface of your green will be. One of the tricks that we use in the field is taking a bright colored tennis ball, and rolling across the surface - watching it carefully. If it bounces cross the surface you'll see that that area is not smooth enough. It is also recommended that you take the string long enough to go from one end to the other. Stretch it tight so you can see if you have high spots or low spots that need your attention. Repeat this in several different angles across your base are. The basic material should be crushed rock that will compact. Depending on the area of the country you're located in, there will be different materials available (3/8 minus crusher fines, # 8 crushed limestone, 3/8 road base , or crushed granet). You can also do your basement material in two layers. The first layer is a road base material that consists of gravel stone approximately 3.5" or more. The second and top layer consists of stone dust, #7 limestone dust, crusher fines or rock dust, as it is commonly referred to. 1.5 to 1.9 tons / 100 Sq. Ft. (roughly 3in. in depth. Make sure to distribute the sub base material evenly. Work with a yard rake spread out the sub base material so that it is consistently flat. Use a shovel to move the large amounts of sub base material and the flat side of a rack to smooth out any rough areas of the sub base. Drainage will come off the top of the green, not through the green. Drainage through the green would eventually deteriorate the packed sub base. There must be a slight slope to the sub base for proper water drainage. A good rule of thumb is a 1 inch drop for every 10 to 12 feet in length. If you do not compact the sub base material properly it will eventually settle in a way that will cause irregularities in the surface of your putting green. These irregularities adversely affect the roll of your ball when putting. Remember that the plate compactor can be rented from any local rental facility. With your garden hose’s spray nozzle wet the sub base lightly. Do Not saturate it. Now compact the sub base. To ensure good solid compaction, make sure to compact the sub base several times the length and width of the area. If there are any small bumps, ridges, or irregular dips remaining smooth them out with your rack or shovel. Use a 2 x 4 to screed or level the base material. You may notice low spots or dips on your base. Chances are that you have a low spot on the sub base that needs to be filled. Your main goal is to keep the surface consistently flat, smooth and solid. Adding undulations or contours is easy. Add additional base material to that area. Shape it with your rake until you have the desired contour and undulation. Compact that area with your plate compactor. Understand a 1 inch rise over 10 to 12 feet will add a lot of contour once the putting green is added. The putting green turf is designed to fit like a glove to the surface. If you add too much slope to your sub base material the ball will roll very fast and may roll off your green. A good basic guideline is for every 10 to 12 ft in the length of your sub base you will drop the slope 1 to 4 inch. To determine whether you have enough or too much slope or contour-- after the sub base material is completely compacted take a golf ball and putt on the sub base. The ball will break the same on the sub base as it will when you install the putting green. Your sub base should be a minimum depth of 4 inches when compaction is complete. Make sure the sub base is the way you want it. If you want to add or take away extra slopes or contours now is the time to do it. However, if you make any changes to the sub base then you must re-compact the sub base after the changes are made. Once the putting green and the infill is added it is difficult to adjust the contours of the sub base. Arrange the cups on the sub base. Mark the place where the cup will be permanently placed. This can be done by applying pressure to each cup and rotating it and will cause a small indentation in the sub base that will be used as a marker or reference point. Because your cups are 6 inches tall you need to make your hole 6 inches + in depth. The cups once placed in the holes should be one quarter inch above the top of the sub base material. Don’t worry if you go deeper because you can always back fill the hole with the base. 1/4'' to 1/2" above base. Add ready mix concrete around the cup & about halfway up the outside of the cup. Next, add sub-base around the exposed perimeter of the cup. Continue to do each hole in the same manner. You might notice small ridges caused from the plate compactor, on your finalized compacted base. These ridges must be removed. The putting green turf will fit like glove to your base so you want the base to be as smooth as possible. Use the bottom of a shovel or hand tamp to flatten the ridges. Use a medium bristle push broom to lightly sweep the sand and any loose gravel off your base. This will fill in any cracks and crevasses and give you a super smooth base. If using the standard 15 ft. wide measurement for your green then you may omit steps 9-12. The seaming techniques create an invisible seam. You will need seaming tape strips and commercial strength turf adhesive. A 1/4 in. notched trowel is needed to spread the adhesive. Place the green on the edge of the sub base and roll it out. 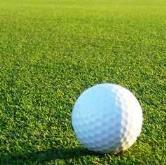 Make certain there are no creases in the turf or it will affect the roll of the ball. If there are very small creases or bubbles don’t worry. When you infill the putting green the small creases and bubbles will go away with the weight of the infill. With a coarse broom, sweep the fibers from the center of the putting green out allowing all looseness to be pushed to the outside. Notice the black strip running the length of each roll. This is mill scrim and it will need to be removed. Take a chalk line and snap a line the entire length of the turf so you have removed the factory scrim. Use a piece of handle iron or a straight edge to use as a guide for your cut.Use a utility knife or a carpet knife For best results. Repeat this process for the a adjacent roll. NOTE: Seam Tape Is Laid With The Shiny Side Down. Proceed with a dry fit!! Position one side halfway over your seam tape. And then tack it down temporary Using 16 penny nails.Note: do not drive these home because you will be removing them to apply your glue. Lay the other side down and kick it (with a carpet knee kickeras) as close as possible to the side that you have tacked down. Lay one roll over where the seam will come together so the black backing is facing up. After the seam has been cut, join the two pieces together to ensure a tight fit before gluing the rolls together in step 12. Remember: Continue to replace your utility knife blade after cutting eight to ten feet in length. The goal is to cut through the turf and not rip through it. Hint: There should an equal amount of turf on each side of the seam. Spread the adhesive over the entire surface of the black strip. Make sure the thickness of the adhesive is no more than 1/4 inch. Allow 10 to 15 minutes for the adhesive to set up and get sticky before seaming. Lay each piece of the putting green turf over at the seam. Starting at one end of one roll, lay one roll onto the adhesive and seaming tape the full length of the seam. Lay the second roll over as you join the two rolls together. 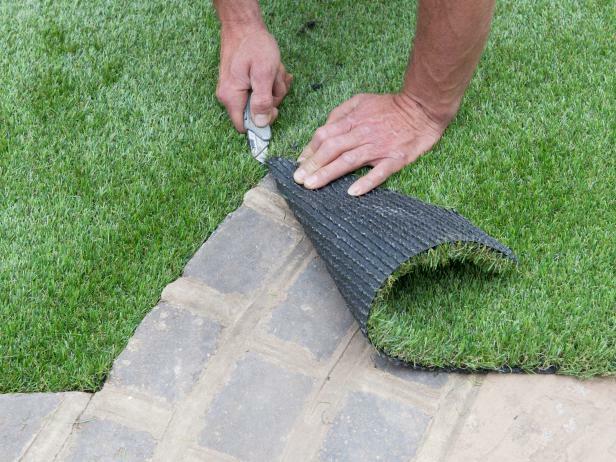 Press the seam in place as you go applying pressure to ensure good contact of the turf backing and the adhesive. Once the entire seam has been placed together walk several times over the area that has been seamed. Allow an hour before starting the infill process. Do Not Cut Out Cups Until You Are Done!!! If you have no edging to run your putting green up against or if you're going to add friends. Using a piece of chalk draw your shape, then stand back and look at it prior to cutting. The green is delivered in a rectangular shape. You may desire to shape the green to give it a natural look. Refer to your brochure for shapes. If you are not adding a fringe turf to your putting green, cut the shape of your putting green using your outside border as a guide. If you desire a fringe around your putting green, use a yard stick to assist you with measurements. For Example - On one installation we used a two foot collar of fringe turf around the putting green. Remember: The fringe turf is functional-- you can chip off of it. On a 30 X 26 putting green the length is 52 feet if you place the two 15 by 26 rolls end to end. A 15 X 27 foot roll of fringe turf is needed to give a 2 ft collar of fringe around the putting green. Use your yard-stick to measure two feet in from the border. Use a string to mark your shape in 1 foot increments. Use a utility knife (with new blades) to cut along the outside perimeter of the string. This gives you the desired shape. To maximize your fringe and minimize waste- Run the fringe turf the length of the putting green on each side first, then the two widths. Hint: The grain of the fringe turf must run the same direction all around the green. Roll out the fringe turf over one side the length of the shaped putting green. Overlap the entire roll of fringe turf just enough to cover the shape of your putting green on one side the length of your putting green. Nail down the fringe into the sub base using 4 inch galvanized nails with small heads 2 inches out into the fringe from where the seam of the putting green turf and fringe turf will meet. Place the nails every six inches the entire length of your fringe turf. Next, come out 1 foot into the fringe turf. Nail down the fringe turf 1 inch out into the fringe every six inches the entire length of the fringe. Nailing the fringe at both the seam and a foot out from the seam will anchor and secure the fringe turf in place and make for a very tight fit. Continue to do this for the entire perimeter of fringe turf. Cut along the outside perimeter where the fringe meets your border. Hint: Replace the blade on your utility knife every 8 to 10 feet of turf you cut to avoid dulling a blade and producing a ragged cut. Try to avoid “ripping” the turf. Do not cut out your cups until you are done sanding! Cutting the Holes is the last step that you do! Infill Material: "Surger Sand" Fine, Dry “clean” (no dust) sand 30/60 grit, some call it fine or “000”. 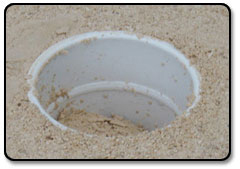 Sand blasting sand works well and can be found in most locations. 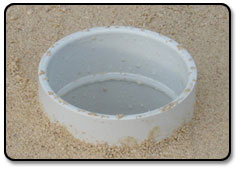 Also look for pool filter sand, but it has to be dry so it will go through the drop spreader. 5/8" DBL Eagle 3 to 3.5 LBS. per sq. ft.
1/2" Eagle II 0 to 1 LBS. per sq. ft.
7/16" Eagle 2 to 2.5 per sq. ft. Some sandblasting suppliers have black diamond and you can use it as a top dressing. 2 lbs. silica and the last .5 to 1 lb. black diamond. Note: You can also run the plate tamper across the green to help vibrate the sand in. Hint: The putting green and infill Must stay dry during this filling process. If the infill or putting green gets wet the infill clumps together, not allowing the infill to get between the fibers of the putting green and be properly filled. Fill the drop spreader 1/2 full with the infill. Spread it across the top of the green. Hint: The weight of the infill will flatten any small bubbles you may have on your green. Do not apply too much infill at any one time without first brushing the infill into the fibers. For example, a good basic guideline is to use 100 pounds of infill over an entire 15 X 30 green between brushings. Remember: Always brush from the center out to take out all air pockets out from under green. You must brush between all infill spreading. Once the green is half full, brush the putting green using consistent force. This infill procedure must be repeated until you have filled the green completely full, close to the top. HINT: You can't overfill the BentGrass green. This applies for all 3 turf lengths..
Over-filling of the green ensures a consistent level of infill across the entire putting green surface. By infilling the fringe turf the fibers will stick straight up or vertical. You only need to fill the fringe turf half full to achieve this. Use your broom to consistently brush against the grain of the fringe. This gets the fibers to stand up. Always brush from the center out to take out all air pockets out from under green. Brush the excess off the putting green. Sweep the green a second time to remove any excess infill. Your goal is to have 3/32 to 1/4 inch max of the putting green fiber exposed. HINT: If the green appears blotchy in color note that the first rain will wash the infill dust off the fibers and settle the infill into the green. Locate the cup holes by pressing the turf with your hands until you feel the holes. Using a utility knife (with a brand new blade) cut the holes out of the turf. Rolling of the green will determine the speed of you putting surface. Using a water filled roller, roll the green the length & width of the entire surface. It will take several times both the length and the width of the putting green to achieve the speed you desire. Once you have done this you will not have to do it again in the future. Our Turf Adhesive is an eco-friendly, single part, moisture curing, polyurethane adhesive. It is designed specifically for bonding various substrates to the backing of synthetic turf. Concrete, Asphalt, Wood and Foam Padding.